The oil palm tree (Elaeis guineensis jacq.) originates from West Africa where it grows in the wild and later was developed into an agricultural crop. It was introduced to Malaysia, then Malaya, by the British in early 1870’s as an ornamental plant. In 1917, the first commercial planting took place in Tennamaran Estate in Selangor, laying the foundations for the vast oil palm plantations and the palm oil industry in Malaysia. The cultivation of oil palm increased at a fast pace in early 1960s under the government’s agricultural diversification programme, which was introduced to reduce the country’s economic dependence on rubber and tin. Later in the 1960s, the government introduced land settlement schemes for planting oil palm as a means to eradicate poverty for the landless farmers and smallholders. 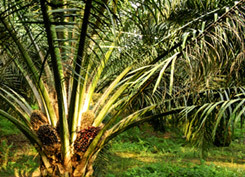 The oil palm plantations in Malaysia are largely based on the estate management system and smallholder scheme.